These are the stories and photos of the pets rescued by our PACC911 LAF during 2015. There were so many recipients saved this year we have multiple pages featuring stories of the pets! 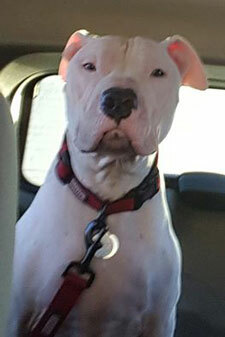 Ash, a pretty white Pittie/Shar Pei mix waited patiently in his kennel at Maricopa County Animal Care and Control. He wondered what was happening around him, and he felt unsure, but remained calm and hopeful. 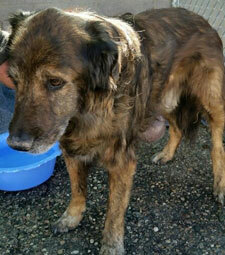 Sadly, though, Ash had allergies and was put on a medical deadline and e-listed. Days passed, and his time was up. Fortunately, Ash would get a second chance! Surrendered Souls Rescue saved him just an hour before he was to be euthanized. Ash was such a happy boy leaving the shelter with these wonderful people. Once Ash was brought into the rescue, Surrendered Souls volunteers realized Ash was deaf and blind! They took him to be evaluated and learned that he was completely blind in one eye and only had about 30% vision in the other, which just allowed him to see changes in light. Ash had never experienced hearing or sight, but just like other dogs without hearing or vision, he got along just fine. Although, nothing could be done for Ash’s hearing, his blindness was actually due to cataracts and could be corrected with surgery. Surrendered Souls was determined to give this sweet boy the gift of sight. They reached out to PACC911’s Lulu’s Angel Fund who gladly offered assistance with medical expenses. Ash’s allergies were treated, and soon he was ready for his eye surgery. It was a success! Now, for the first time, Ash can see the world around him! Ash’s life was not only saved, but changed forever. 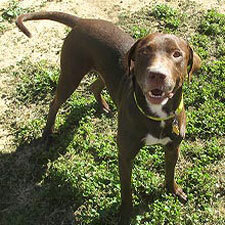 He is a fun loving guy has even more to look forward to as he waits to meet his forever family. Ash will have some recovery time from the surgery and will be ready for adoption soon. Betty Boop was found in agonizing pain laying on the side of the road. She had been hit by a car and endured such a bad fracture that her bone was coming through the skin. She couldn’t move. Betty Boop was picked up by Maricopa County Animal Care and Control. She was safe from the streets, but she still lay in her kennel in terrible pain. 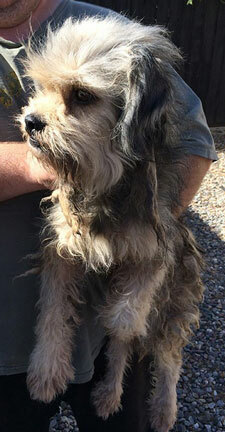 Saving Paws Rescue was contacted and came to Betty Boop’s rescue. Saving Paws took Betty Boop straight to the hospital so she could be evaluated and receive pain meds while treatment was determined. They reached out to PACC911’s Lulu’s Angel Fund who gladly assisted with medical expenses. Betty Boop was so relieved! Finally, the pain was gone, and she felt safe and calm surrounded by these loving people who saved her life. Betty Boop’s injury was critical, and she had surgery right away. The surgery went well and she stayed brave throughout the procedure and many days of healing. Betty Boop will be closely monitored as her bones mend and will be ready for a little more activity and therapy soon. Thanks to Saving Paws Rescue and PACC911’s Lulu’s Angel Fund, Betty Boop is on the road to recovery. She is a beautiful, loving girl and will ready for adoption soon. 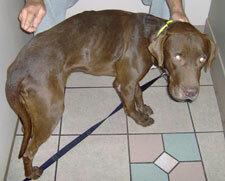 Brady, a young chocolate lab, had been neglected and starved. 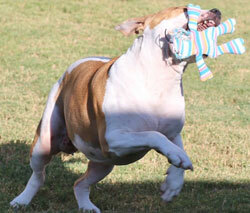 He was rescued from his cruel home and brought to Maricopa County Animal Care and Control. Brady was lucky and a family adopted him. Although he was still gaining weight and recovering, it seemed his life was about to turn around! But, it was not to be. In addition to being emaciated, Brady was sick from his poor living conditions, and although he just needed medication and time to heal, his adopters brought him back to MCACC. Now, because of his poor health, Brady was put on a medical timeline, and placed on the e-list. Brady was weak, and he felt confused and scared. Through it all, though, this sweet boy’s loving nature was evident. Even though Brady had likely never known affection, his heart ached for someone to love him. Sadly, though, his life would be cut short. Just as time was running out, Animal Benefits Club saved Brady’s life! They took him into their rescue and would heal his body and soul. He needed medical treatment to recover from the malnourishment and illness, and PACC911’s Lulu’s Angel fund assisted with expenses. Today, Brady is happy and healthy. He is so grateful for the love he gets from the volunteers at Animal Benefits Club. Even more of Brady’s sweet, easy-going personality shines through each day. Brady finally knows comfort and affection, and can’t wait to be adopted by a devoted family who will love him forever. Butch is a gentle, old soul that will melt your heart. Sadly, Butch’s long-time owner died in his home, and for days, Butch and his dog sibling were in the house with him, confused and scared. What had happened to their beloved “dad”? What would happen to them? Their answer came. The family came to check on Butch’s owner, finding him deceased. Heartlessly, the family took Butch’s younger, smaller sibling and simply called Maricopa County Animal Care and Control to come and get Butch. After all, he was old and obviously had medical issues… Which also meant it was likely a death sentence for Butch. Butch was heartbroken and terrified! He longed for his owner to whom he had been loyal his whole life. He cried and howled as he was driven away from the only home he had ever known. What was happening?? At MCACC it was discovered he had tumors, likely cancer. Unfortunately, because of his age and condition, his chances to be adopted were slim. Butch was such a sweet, mellow guy, but could not hide the sadness in his eyes. MCACC volunteers and animal rescuers began sending pleas out to save Butch and find him a hospice foster so he did not die brokenhearted, alone in a kennel. 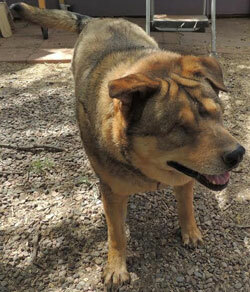 Working together, Valley of the Sun Dog Rescue and 2nd Chance Dog Rescue saved Butch. Valley of the Sun pulled him from county. 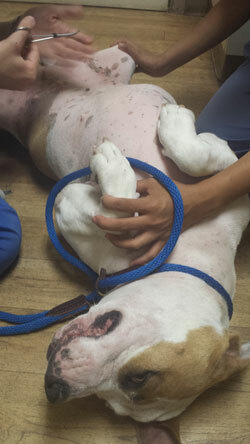 2nd Chance Dog Rescue found Butch a loving foster home, and would get him medical attention. PACC911’s Lulu’s Angel Fund provided financial assistance for Butch’s medical needs. As suspected, Butch has mammary cancer, and he had surgery right away to remove the tumors. He is comfortable now, and lives in a wonderful foster home where he will be loved for as long as he has left on Earth. As we know, the power of love and happiness is amazing! Months after surgery, this old guy is doing great. He loves hanging out with his new dog siblings, romping in the yard, and cuddling with his doting family. Butch is a happy guy and shares his joy with everyone he meets. Butch’s story actually reveals an unfortunate truth, which is that many seniors find themselves in similar situations. Some are not so lucky. Butch is an inspiring example that reminds us that we can still make a difference in the lives of seniors too. 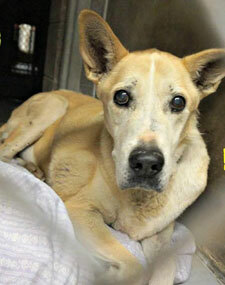 Duchess, a senior cattle dog mix was picked up as a stray, and taken to Maricopa County Animal Care and Control. She was approximately 10 years old and had tumors all over her body. She was put on a medical deadline, and like so many seniors who find themselves homeless at MCACC, she faced untimely death from either heartbreak or e-list. 2nd Chance Dog Rescue made a commitment to Duchess. They took her in, and while continuing to search for her family, they would make sure she lived out the time she had left, even if only days, in comfort and surrounded by love. PACC911’s Lulu’s Angel Fund assisted with medical expenses. A visit to the vet revealed she had arthritis, a case of kennel cough, and cancer throughout her body. Duchess was put on pain medication for her arthritic pain and was treated for the kennel cough. Her cancer could not be cured, but she was comfortable and at ease. Best of all, Duchess was in a wonderful foster home with an adoring family, grandparents, and even a few foster siblings. She went on short walks, and got all the belly rubs, hugs and kisses she wanted! Although, her family was not found, Duchess was a happy girl and loved her new family and returned their affection. Her spirit was lifted! Though, it was first thought that Duchess might only have days to live, surrounded by love, she actually lived a full life for months before she succumbed to the cancer. Thanks to 2nd Chance Dog Rescue and PACC911’s Lulu’s Angel Fund, Duchess lived her final days with a happy heart and crossed over in the warm, loving arms of family. Eva was dying. She knew her condition was dire, and she lay curled in a ball, trembling. She was so emaciated that her skeleton showed through her skin. 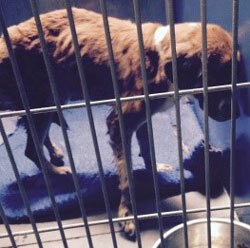 Volunteers and staff at Maricopa County Animal Care and Control sent pleas out to save this poor girl’s life. Eva needed help right away or she would not make it. At the hospital, Eva’s condition was revealed, and sadly, it was grim. Eva had Distemper and secondary infection, Mycoplasma. Distemper is a deadly virus, with a very low survival rate. Eva’s will to live would certainly be tested. She would fight for her life, and would have to gain strength from the love of her saviors. Eva was determined to live. Each day was crucial, and after two trying weeks, in the care of her faithful medical team, Eva had made enough steady progress to leave the hospital. She certainly was not well, and had many critical days ahead of her, but at least she would continue to heal in the comforts of a home. In fact, she had won the hearts of her caretakers at the hospital and would spend several weeks in her doctor’s home as a medical foster. It has been a very long and challenging journey for Eva, but thanks to Second Chance Dog Rescue, PACC911’s Lulu’s Angel Fund, and a dedicated medical staff, Eva has won the battle for her life. She is a healthy girl and lives with her new foster family. Eva is affectionate, well-mannered, and loves everyone. This beautiful girl is ready for adoption and looks forward to finding her forever family. 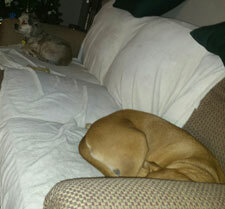 Fabio, a gray terrier mix, and Shelby, a brown pittie mix had lived outside in the backyard all of their lives. These gentle, loving souls were never allowed indoors with their family. Then Fabio and Shelby lost their home. Help a Dog Smile Rescue took them in, to make sure they found a new home, but the years of outdoor living and lack of care was apparent. Although very sweet dogs, their health condition was disheartening. Poor Fabio, who had been known to his family as Fatboy, was actually extremely thin under matted fur. He also had untreated ear infections that had become horribly painful. Shelby was also very thin, and both dogs were covered in thousands of seed ticks. At the vet, they learned that Fabio and Shelby both had tick fever and would require a regimen of treatments. Both also needed dental work, and Fabio needed medical attention for his ears. Fabio and Shelby also needed a nourishment plan to gain weight. Help a Dog smile reached out to PACC911’s Lulu’s Angel Fund who gladly assisted with medical expenses for the loveable pair. The ticks were eliminated and the dog’s skin healed from the scabs. Both gained healthy weight, and Fabio’s ears cleared up. Fabio and Shelby were ready for their new lives, hopefully together. And great news! This pair was adopted! They now enjoy the comforts of indoor living and lots of affection. They go to the dog park to play, and go along with their family on walks and hikes. Thanks to Help a Dog Smile and PACC911’s Lulu’s Angel Fund, Fabio and Shelby are living the life they deserve and sharing love every day with their new adoring family. Melody lived a short and tortured life on this Earth. Tragically, all we can do is take comfort in the fact that because of the compassion of 2nd Chance Dog Rescue and PACC911’s Lulu’s Angel Fund, Melody crossed over relieved from suffering and with loving arms around her. Horrifyingly, when Melody was found, she had been doused with chemicals by a merciless human. The skin on her head and paws was literally falling off and she had been blinded. 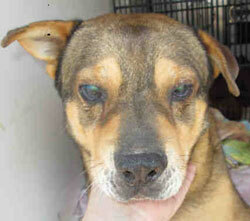 2nd Chance Dog Rescue took her to the hospital to relieve her pain and determine her condition. 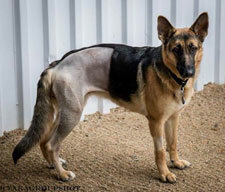 PACC911’s Lulu’s Angel Fund provided financial assistance for her treatment. At the hospital, Melody was made comfortable with pain medication, antibiotics, and a warm bed. Sadly, in addition to the unthinkable cruelty, Melody had been born with congenital hydro-encephalitis, in which excess cerebral fluid puts pressure on the brain causing brain damage. Just two days after being rescued, Melody’s saviors had to let her go. Melody crossed over knowing she was loved and that her life mattered to these kind humans who eased her pain and held her tenderly. Mira was starved and then abandoned along a wash, left to die. She was so close to death, she could not even get up or move from the blanket on which she lay. Thank goodness, this gentle senior boxer was spotted by good Samaritans. She was just a skeleton, and her rescuers went into action to try to save her. 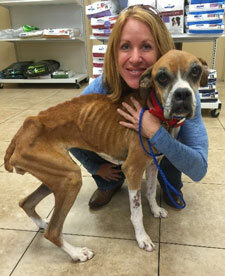 They reached out to the rescue community, and Boxer Luv Rescue stepped in to help. Mira was rushed to the hospital in critical condition. Tests and x-rays revealed the sad truth about what Mira had endured. She was infested with ticks and was severely anemic. She was likely bleeding internally. Tragically, her stomach and intestinal tract were full of rocks as this was all she had to eat, trying to stay alive. 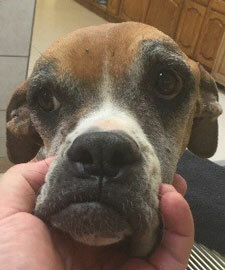 Mira’s chances of survival were uncertain, but Boxer Luv Rescue would not give up on her. Boxer Luv Rescue contacted PACC911’s Lulu’s Angel Fund who provided financial assistance to help with this unfortunate girl’s medical needs. She could not die like this! She deserved a life of health and happiness. As weak as she was, Mira knew she was in good hands and felt hopeful. Her eyes began to brighten as her saviors stroked her thin body and spoke reassuringly to her. She was responsive to their touch and words, wanting them to know she was fighting to stay alive and appreciated their dedication to her life. After weeks of intensive care in the hospital, Mira began to gain weight. She battled back from certain death! She still has a long way to go, but Mira is now in a loving foster home where she will continue to heal her body and soul. Her sweet and engaging personality shines through more and more each day as she gets stronger. Thanks to good Samaritans, Boxer Luv Rescue, and PACC911’s Lulu’s Angel Fund, this lovable, senior gets a second chance at life and love. 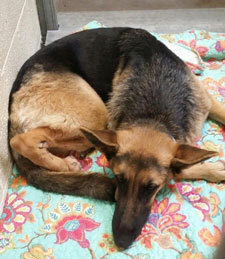 A devastated German Shepherd was brought into Apache Junction Animal Control as a stray. This poor girl was barely surviving. She was starved, and her abdomen was distended. She had missing fur patches all over her body and her hair fell out by the touch. She had a mass on her shoulder, bite marks on her hind legs, and multiple wounds all over her body. She was in terrible shape and was placed on the e-list. The shelter reached out to Saving Paws Rescue. 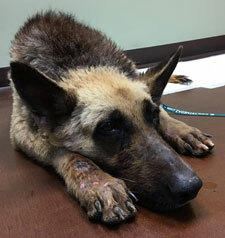 In this girl’s grave condition, her prognosis was unknown, but Saving Paws came to her rescue. They named her Reva, which means “regain strength”. She would need a lot of strength in body and soul to overcome what she had endured. Reva was taken to the hospital for tests and treatment. 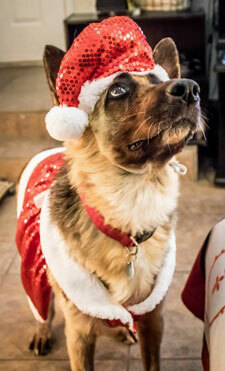 Saving Paws reached out to PACC911’s Lulu’s Angel Fund who helped with medical expenses. The x-rays, testing, medications, and nutrition began, along with lots of love and reassurance. Reva moved into her foster home to recover from her wounds and gain a healthy weight. 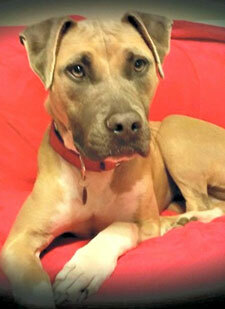 She is comfortable, loved, and gaining confidence with her loving foster mom and dad and two dog siblings. Today, Reva is still healing, but she is feeling good, and her sweet personality is shining through. Thanks to Saving Paws Rescue and PACC911’s Lulu’s Angel Fund, Reva has a new life in which she is safe and happy. Reva will be ready for a loving forever family soon. 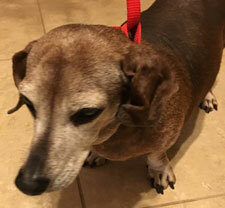 Roscoe and Ms. Daisy, two senior Dachshunds, were turned in to Maricopa County Animal Care and Control. 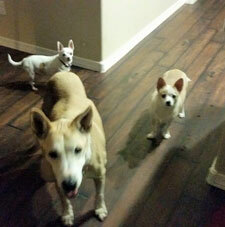 Roscoe, 10 years old, and Ms. Daisy, 8 years old, both had medical issues due to neglect. Now, they faced the e-list. It was heartbreaking, as with so many seniors turned in to MCACC, you could see this sweet pair still had lots of love to give. Arizona Happy Tails Dachshund Rescue saved Roscoe and Ms. Daisy and placed them in loving foster homes. They reached out to PACC911’s Lulu’s Angel Fund who assisted with medical expenses. Roscoe had surgery to remove tumors on his body, and teeth pulled due to dental disease. Roscoe was severely overweight putting stress on his aging joints. Now on joint supplements and eating a nutritious diet, he is losing weight making it easier for him to move around. Roscoe feels great and loves people and dogs too. He is ready for adoption and looks forward to finding his forever home. 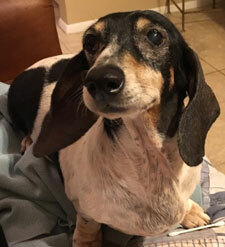 Ms. Daisy also had dental disease, so needed surgery to remove teeth. She had ear infections, skin irritations, and eye issues due to allergies. Ms. Daisy is still being treated, but is feeling better thanks to a new diet, soothing shampoo, and allergy medications. She loves people and affection. Ms. Daisy will be ready for adoption soon too. Rainey was living in the gravel pits in South Phoenix for at least a year. During that time, Arizona St. Bernard Rescue and PACC911 partner rescues attempted to save Rainey and other dogs living there, but were unable to capture them due to the vastness of the area. In August 2015, Rainey was picked up by Maricopa County Animal Care and Control. They reached out to Arizona St. Bernard Rescue to help her. 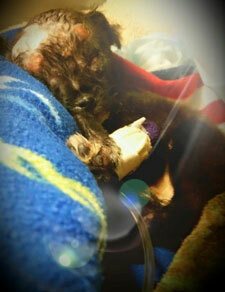 Rainey had a broken leg, was severely emaciated, and in overall poor health. She needed medical attention right away or she would be euthanized. 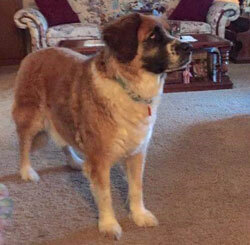 Arizona St. Bernard Rescue went to Rainey’s aid. She was in such poor condition, she had to be carried out of the shelter to her new life. Rainey was taken directly to the hospital where she would spend the first phase of her recovery. Her broken leg was too old to repair, and medical staff was unsure if she would walk again. Rainey also needed to regain her health and build strength. 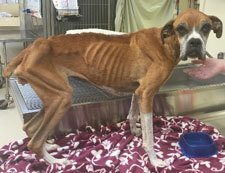 PACC911’s Lulu’s Angel Fund was contacted and assisted with medical expenses for this poor girl. In addition to her many health issues and broken leg, it was learned that Rainey had given birth to puppies within the last month, but they were not found. Sadly, the pups were likely victims of the wild dogs surviving in the pit, and Rainey had been unable to save them. After a long stay in the hospital, she was finally stable enough to go to a medical foster where her health could continue to be monitored. Rainey would begin her new life of living in the comforts of a home, but she had to learn to interact with humans and trust dogs again as she had survived by defending herself for so long. Over time, with love and support, she began to tolerate her foster siblings as well as trust and enjoy human contact. Today, Rainey has come a long way. She is a healthy girl, and her leg did heal so she can use it. 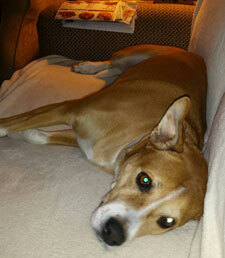 Rainey has found her forever home and lives a happy life knowing she is loved. Kimberly lived her whole life outside enduring the unbearable Arizona sun. As a result, she developed skin cancer. After years of neglect, when she needed them most, Kimberly’s “family” turned her into MCACC. Due to her health issues, Kimberly was placed on medical deadline, and within days, was e-listed. Sadly, Kimberly would have lived a lonely life of suffering, only to be euthanized in the shelter. Surrendered Souls would not let this happen. Not sure of her final prognosis, Surrendered Souls would make sure Kimberly knew happiness in her life, no matter how brief, and they took her into their rescue. Kimberly was diagnosed with two types of skin cancer. She would have a long battle for her life, but Kimberly could be saved. Surrendered Souls would give her that chance, and they reached out the PACC911’s L.A.F. Program for financial assistance. Kimberly underwent surgeries and chemo treatments for her cancers. Finally knowing love and affection, Kimberly had the will to live, and she won that battle for her life. Today, Kimberly is a very happy girl, and her doctor says she has many years left to enjoy her new life. She loves having people who care about her and is ready to share her joy with a new forever family. Charlie lived tethered to a pole with a twenty-pound chain wired to his neck. We can only imagine the suffering poor Charlie underwent the first six years of his life. It is heartbreaking to think of the loneliness, fear, and pain he endured day after day. Despite the dreadfulness, Charlie’s amazing spirit was not broken, and somehow he escaped from his horrifying existence. He was found running through traffic struggling to pull the heavy chain, so desperate and hopeful someone would help him. Cochise Canine Rescue would be Charlie’s saviors! They took him into their rescue and gave him love and hope. At the hospital, it was learned that Charlie’s untreated glaucoma had actually resulted in blindness and he would need surgery. They reached out to PACC911’s L.A.F. Program to help with medical costs. With lots of affection and reassurance, Charlie healed and loved his life with his rescue family. He felt pure joy in his heart, gave everyone he knew lots of kisses and hugs. Sadly, Charlie crossed over several months later, but not before he knew how it felt to be adored, and not before shared his special spirit with many humans who will never forget him.